The Diamond Jubilee Wood in Whitehead. Whitehead’s significance during WWI is to be highlighted with the installation of an airfield memorial marker at the Diamond Jubilee Wood. The proposal was approved by councillors at last Tuesday night’s meeting of Mid and East Antrim Borough Council’s Operational Committee. What the memorial will look like: ABCT's Kenneth Bannerman (left) helps to unveil a marker at Leavesden in May 2013. From 1915 to 1918, Bentra Aerodrome in Whitehead was home to the first military aviation facility in Ireland - one that played an important role during the First World War. Royal Naval Air Service airships based at Bentra patrolled the water between Ireland and Scotland, combatting German U-boats. Meanwhile, the Diamond Jubilee Wood was created in 2012, marking Queen Elizabeth II’s 60th year as monarch. The venue is also a Fields in Trust ‘Centenary Field’ due to its significance to WWI. A report to elected members read: “The Airfields of Britain Conservation Trust exists to preserve Britain’s former airfields that deserve recognition as heritage sites. They have had an airfield marker programme running since 2009 and hope to install 400 by 2030. The application would seek to deliver further initiatives related to the site such as a ‘pop up’ museum and a visit from a reconstructed airship control car, members heard. The 1.2m high granite marker will be “fully funded” by the Airfields of Britain Conservation Trust, the report added. Seconding Ald Gregg McKeen's proposal to approve the plans, Cllr Paul Sinclair said: "I am very happy to second this motion 100 years after the forming of the Royal Air Force this month. "This marker points to an important piece of local aviation history. Mid and East Antrim Council are taking advantage of a great opportunity to recognise Whitehead's part in the war effort and we will have a historic landmark strategically placed in the Jubilee woods area for future generations." The marker will be the first one in Northern Ireland for the Airfields of Britain Conservation Trust, said Kenneth Bannerman from the organisation. 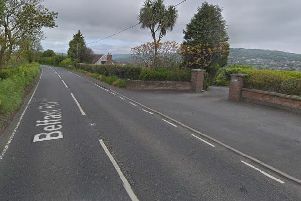 "We've been trying to get memorials in Northern Ireland since early 2007, so we're pleased to finally get the go-ahead for this," Mr Bannerman added. "It's important that we don't take our airfields for granted; they have been described as one of Britain's greatest physical assets." For more information, visit the Airfields of Britain Conservation Trust website.